Getaway is an experimental single-player map for Call Of Duty. It re-scripts the CoD "Dawnville" map as a car-ride challenge, with tanks, bikes, nazis, explosions, and even a little map-extension. Getaway makes heavy use of maps, textures, code, and models from the CoD single player campaign, so credit goes to the IW artists. The map ends after you "land" back in the field near where you started. This is the first map (according date associeted with files) that was created as a SP campaign, I found it browsing on the net for some info associeted with another file and stopped here witch is first a place for Mp release. It's not really a full release like it is described but more a kind of scripting associated with some original creation of Infinite Ward. I will so just focus on gameplay cause most of the mapping part was just shared from the original game. 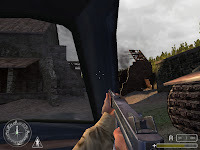 Gameplay is quite short an intense in one of my favorite map from the original game called Sainte Mère l'Eglise. 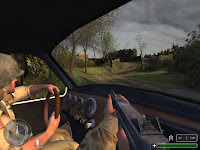 This time you will need with two team mate to drive a car and try to escape from this german nest... action even if quite short is well handled and full of surprise it's certainly not an easy one to succeed in just one try but it's not a disadventage regarding the shortness of this release. There is not much to say about just try it an enjoy. In conclusion: i never heard from this one before that i found with two other maps on a german server. It's not a real entire new release but it introduce a good scripted sequence action-packed that's worth the time especially regarding the date it was release.